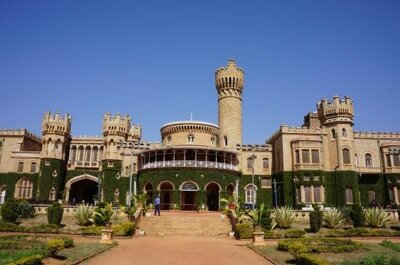 Bangalore Palace, a palace located in Bengaluru, Karnataka, India, was built by Rev. J. Garrett, who was the first Principal of the Central High School in Bangalore, now known as Central College. The construction of the palace was started in 1862 and completed in 1944. In 1884, it was bought by the then Maharaja of Mysore Chamarajendra Wadiyar X. Now owned by the Mysore royal family, the palace has recently undergone a renovation.Rev. J. Garrett, the first principal of the Central High School, built this palace with a floor area of 45,000 sq ft (4200 m²). The palace and the grounds surrounding it are spread across 454 acres (183 ha). British officials who were in charge of the education of the young prince HH Chamaraja Wodeyar bought the palace in 1873 A.D. from him at a cost of Rs. 40,000 and later renovated it. In some stories, it was also seen that Tipu Sultan used to spend his summer holidays in Bangalore palace with his parents. 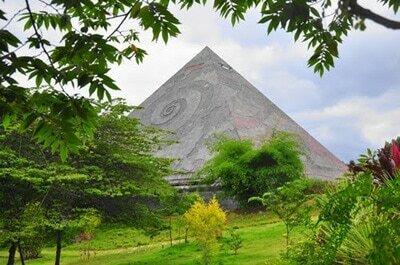 Perched quietly in the middle of the valley, the Pyramid Valley campus is a marvellous sight! 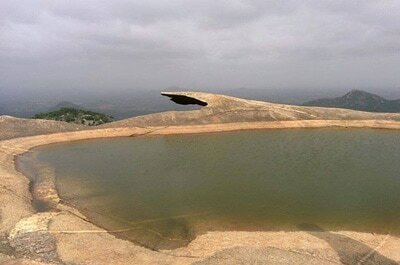 Located around 30 km from Bengaluru, it is nestled amidst lush green valleys and rocky hills. This slate gray Maitreya Buddha Pyramid has been built solely for meditation. The dimensions of the pyramid are quite impressive, it is 102-ft high, has a base area of 160 feet X 160 feet and can accommodate 5,000 people. Even though there are a number of meditation pyramids in India and all over the world, the Maitreya Buddha Pyramid is by far the largest. Inspired by the pyramid of Giza, the base of the pyramid at Pyramid Valley is made of concrete cement, while the rest is a steel structure. 40,000 cement tile have been placed on this steel frame to form a beautiful mural depicting the elements. The north face depicts air, the south--fire, the west--earth and the east--water elements. The huge space inside the pyramid represents the fifth element. This place provides free lunch and dinner to all the visitors and the donations are used to cover the costs. Avala Betta 2 km of cement road with steep hairpin bend turns offered a thrilling experience. Fist we visited Govt Guest house, to my surprise there were already 4 - 5 bikes parked, needless to mention they were from Bangalore. I wasn't expecting anybody else as its not a well known place. We were standing on the terrace of the guest house, the sun was shining from far distance. It offered a decent view with a lake guarded by rocky outcrops and the horizon marked with a band of blue hills the panoramic vistas were a treat to the eyes. We spend couple of minutes taking photographs and enjoying the cold breeze. Its time to explore the temple and its premises. 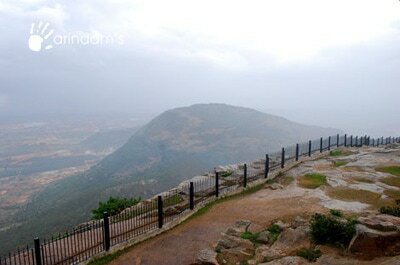 One has to walk couple of steps to reach the cave temple where Lakshminarayan Swami idol is installed and worshiped. However temple was closed and there were no one around. The staircase behind the temple lead to the summit of the hill where the most stupendous views can be seen in all directions. There is another temple at the summit. We saw pound behind the temple and decided to go there. St. Mary's Basilica is a basilica located in the Archdiocese of Bangalore in the Indian state of Karnataka. 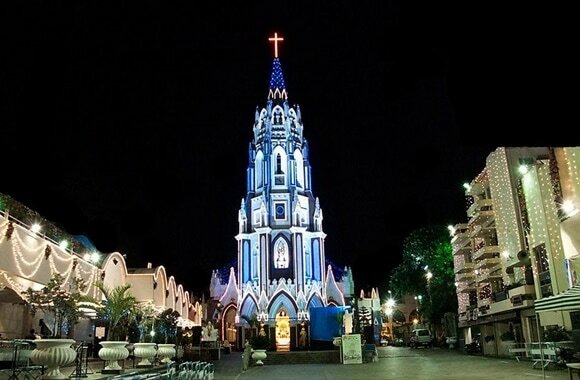 It is among the oldest churches in Bangalore and is the only church in the state that has been elevated to the status of a minor basilica. It is famous for the festivities held during the St. Mary's Feast in the month of September each year, an event that attracts a number of devotees from in and around Bangalore.St. Mary's Basilica had a humble beginning as a thatched hut in the 17th century, built by Tamil Christian migrants from Gingee. The Shrine was then known as 'Chapel of Kanikkai Madha' and was located in their village where rice was grown. The rice grown in the village had a distinct white colour, and hence the settlement came to known as Bili Akki Palli or colloquially known as ‘‘Blackpally’’ (now known as Shivajinagar). (However, according to well known historian S K Aruni, Blackpally could have been named after John Blakiston (1785-1867), who designed the layout of the Bangalore Cantonment.